How can we tell if the syrup is ready? That is a good question. There are several methods, old and new, to know if the syrup has the right density. Although I have already given a few recipes for spoon sweets (fruit preserves), I forgot to mention how can we tell if the syrup is ready. It is very important for spoon sweets and jams that the syrup has the proper density. If you do not want to see those sugar crystals at the bottom of the jar or mildew on top, there are a few ways to test if the syrup you have prepared has the right density. Depending on the content of water in each fruit some take more time than other fruit to set. Place some syrup in a spoon and let it drip away in the saucepan. When the syrup flows away easily, it means it is still watery and not ready. Continue boiling until the flow separates into drops. When a final drop remains hanging from the spoon, it means that the density is right and the syrup is ready. If not, that means that the syrup is not ready and you should repeat the procedure again. Chill a saucer in the refrigerator. Put a few drops of the mixture on the small plate and try to move it around. If it starts flowing then the syrup is not ready yet. If it resists movement, then it is ready; remove from heat immediately. Of course, if you have a candy thermometer things are much easier. You test with the termometre until it reaches 105o C / 220o F.
Note: If the syrup of the spoon sweet is properly thickened, then all the spoon sweets can be preserved for a very long period of time without having to keep it in the refrigerator. Follow the instructions in each recipe as well as the above method. 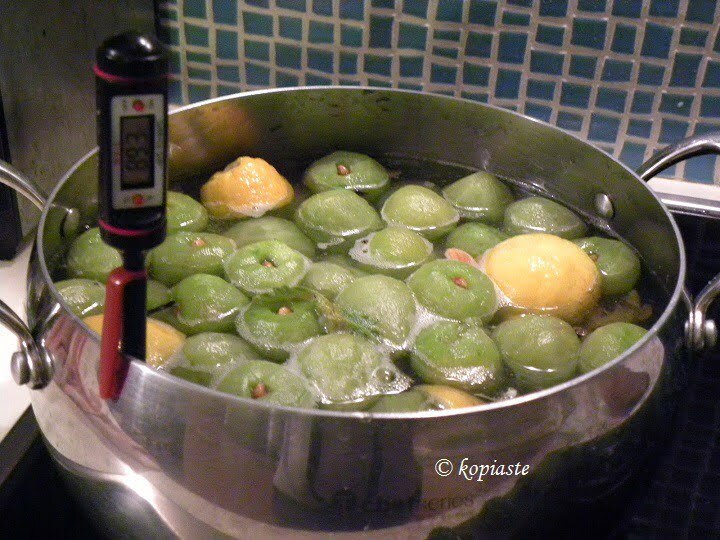 If you have done all the above and the syrup has not set, this means that the fruit did not have enough pectin. This can be fixed by adding powdered pectin. Bring to a boil again for 1 – 2 minutes and follow the instructions on the package. The one I use is 1 sachet (25 grams) powder for 1 kilo fruit and 500 grams sugar. Store the jam in a cool, dry place and when opened store in the refrigerator. For other syrups, used for making liqueurs, wetting cakes, etc., (usual ratio 1:1) after boiling point, reduce heat and simmer for 5 minutes. Tip: Always add lemon juice in your syrup as it contains pectin and it will also prevent sugar from crystalizing. Please, I need a Chrismas cake recipe.